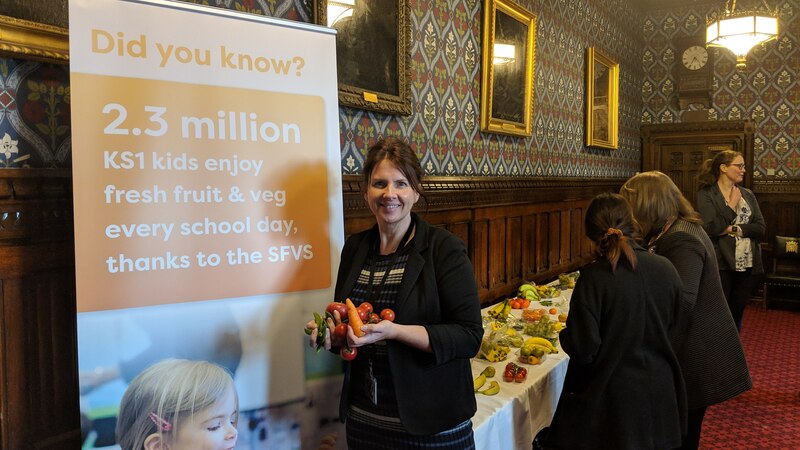 Trudy Harrison has met with a leading supplier for a fruit and vegetable scheme in English schools last week, at an event hosted in the Palace of Westminster. Trudy Harrison today met with representatives from Minor Weir and Willis Ltd (MWW) - which has been one of the suppliers of the School Fruit and Vegetable Scheme (SFVS) since it launched in 2002 - to learn more about the scheme, which provides a Government-funded piece of fruit or vegetable each day to all Key Stage 1 (four to six year-old) children in state-funded English primary schools. Each school year, the programme delivers in excess of 400 million pieces of fresh fruit and vegetables to more than 2.3 million children in 16,600 schools. More than 30 MPs attended the event, hosted in the Jubilee Room in the Houses of Parliament, where they got to sample some of the fresh produce that youngsters across the country are eating every school day. Mark Driver, Public Sector Lead at the Birmingham-based supplier, said the Government-funded programme has proven invaluable in helping children to develop healthy eating habits from an early age. “For too many youngsters, the SFVS produce may be the only fresh fruit or vegetables they eat in a day,” he said. “The scheme provides children with a healthy, mid-morning boost and it also offers a great opportunity for them to try new foods with their classmates, which in itself is a valuable social occasion. MWW hosts classroom workshops with pupils at its partner schools to educate them about the benefits of healthy eating and to introduce new fruit and vegetables into their diet. “Over the years we’ve worked with several MPs to raise awareness of the scheme, with a number of them coming along to our workshops to see the difference fresh produce makes to the pupils,” continued Mark. “We wanted to host this special event in the Houses of Parliament to update them on the scheme’s ongoing success and the fantastic impact it is having on the health and wellbeing of children in England.